Would you like to have a go at sailing? And see if you like Ripon Sailing Club? Come along for a taster sail. Taster sessions are offered to non-members, but you will need to be a member of the sailing club to join our beginner training courses. Taster sails usually take place on selected Saturday afternoons, Sundays, or early evenings on Wednesdays when we have safety boat cover and an instructor available. Taster sessions can be booked for adults and children, but please note that children under 16 will need to have an adult on site. The sessions costs £30 per person or £50 for a couple or family (maximum: 3 adults, or 2 adults + 2 children under 16, or 1 adult + 3 children under 16) and usually last around an hour and a half. 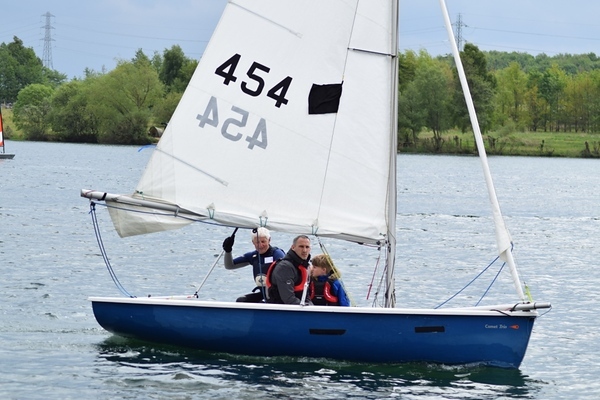 If you decide to join Ripon Sailing Club within a month of the taster sail, the cost will be deducted from your membership fee. During the session, one of our RYA qualified instructors will take you out in a double handed dinghy and, if the wind conditions are suitable, you will have a go at steering the boat. Buoyancy aids are provided. During the session the instructor will introduce you to the facilities we have at the club and give you information on membership and our RYA Learn to Sail courses, should you be interested.